1. Dora Wheeler, “Penelope Unraveling Her Work at Night” (1886). Silk embroidered with silk thread. Image: Metropolitan Museum. We suitors have not done you wrong. Go blame your precious mother! She is cunning. that she has cheated us of what we want. but all the while her mind moves somewhere else. a mighty loom inside the palace hall. to bury good Laertes when he dies. finish it!’ And her words made sense to us. and then at night by torchlight, she unwove it. For three long years her trick beguiled the Greeks. a woman slave who knew the truth told us. and made her finish it. +Compare Penelope’s version: Odyssey 19.137-163 (p429). like Artemis or golden Aphrodite. who had attached a footstool, all in one. and pensively Penelope sat down. from which the arrogant suitors had been drinking. at night and spying on us women here? Get out, you tramp! Be happy with your meal! Or you will soon get pelted with a torch! and make a calculated speech. “Insane! to scold the slave. “You brazen, shameless dog! What impudence! I see what you are doing! Wipe that impertinent expression off! to question him about my missing husband. for her sake and for yours — you move my heart. are so much like my master’s. 6. The other side of the Penelope loom vase (see wk 2). Attic red-figure vase (skyphos), 450-400 BCE in Chiusi, Museo Archeologico Nazionale. Odysseus (inscribed) wearing a hat (pilos) with staff and vessel; his leg is washed by the old slave woman, named Eurycleia in the Odyssey but here called “Antiphata” (in the inscription). Eumaeus (inscribed), the swineherd, stands behind. 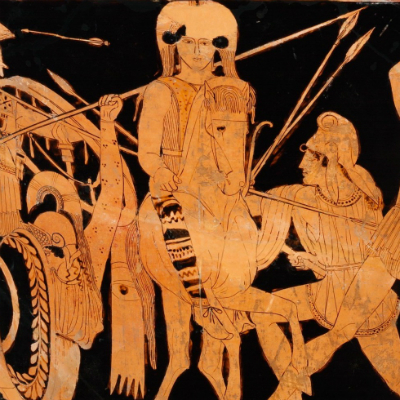 Image: perseus.tufts.edu. “Nanny! Why are you trying to destroy me? Odysseus already had a plan. “Nanny, why do you mention them? No need. “… But tell me now about the household women. I will tell you exactly how things stand. and taught to tolerate their life as slaves. ignore me, and Penelope our mistress. since he is young and only just grown-up. and they went back inside. was furious, and told his loyal wife. English translations: Homer’s Odyssey, Emily Wilson (2018); Homer’s Iliad, Robert Fagles (1990). → Female body as nature, as object. ← A different kind of translation.